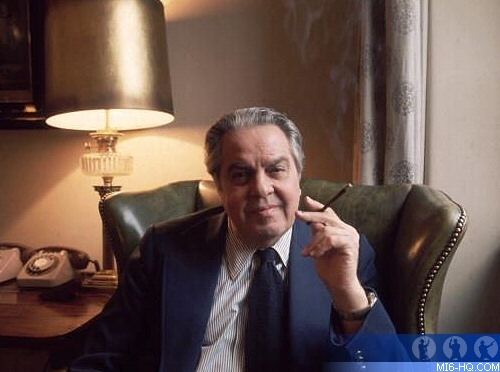 Albert Romolo Broccoli was born on April 5th 1909 to an Italian-American farming family on Long Island, New York. His parents were both immigrants from Calabria, Italy. As a youngster, Broccoli would sell fruit and vegetables in the summer and Christmas trees in the winter at hawker stalls in New York - all of the produce was homegrown on the Broccoli farm. Incidentally, it is believed that the Broccoli name came from the 18th century when Albert's ancestors crossed cauliflower with pea seeds to create the popular vegetable. On the passing of his father, Giovanni Broccoli, the family relocated south to Florida but Albert elected to stay closer to home - moving to Queens, New York with his grandmother where he would get a job in a pharmacy and later as casket maker at a funeral home. Broccoli had been affectionately dubbed "Cubby" since his early days, due to his physical likeness of the popular cartoon character, Abie Kabibble and the name stuck all the way through his film producing days. He was first called Cubby by Pat DiCaicco, his cousin. Cubby first got a taste of Hollywood when he visited his cousin Pat - a hotshot film agent - with probable mob connections, working in Las Angeles. Whilst he was on the West Coast, Cubby was given the opportunity to observe filming on "The Outlaw". 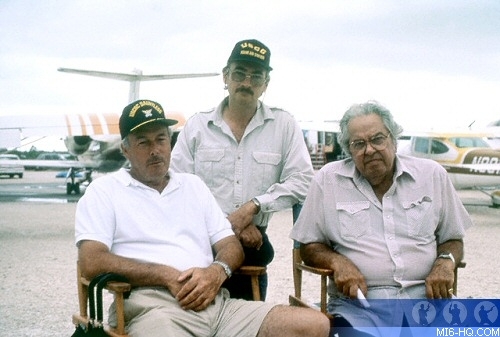 On set, Broccoli would first meet the exocentric billionaire, Howard Hughes, who was financing the picture. At this point, Hughes had fired his director Howard Hawks and was helming the project himself. When Broccoli was introduced to the producer-turned-director, he was welcomed back the following day - this time with a paid position on the crew. Cubby and Hughes would go on to forge a lifelong friendship and on the set of the 1941 western, Broccoli gained a great life-long love for the film industry. DiCaicco tried to talk Broccoli into residing in LA permanently and wined and dined his cousin - introducing Cubby to an illustrious era of Hollywood faces, including Randolf Scott, Carry Grant and Bob Hope. But for now, Cubby had his finances to attend to and soon had to return home to New York, taking a job as a beauty products salesman. The opportunity to break back into Hollywood came to Cubby with a lucky streak betting on horses with his friend, Bob Howard, the racehorse millionaire. In an immense stroke of luck, Cubby had earned enough to give up his door-to-door job and head to Las Angeles. By the time World War II broke out, Cubby was under contract with 20th Century Fox as an Assistant Director (one of DiCaicco's many contacts was the film company's president, Joseph Skak). In 1940, Broccoli married Gloria Blondell, the actress and sister of Joan Blondell, whom he had met in his new social set. Shortly after the wedding, Cubby was called up to fight with the US Navy after the events of Pearl Harbour. Broccoli served in the forces for four years (1941-45) before returning to LA to find his spontaneous marriage very cool indeed. The pair were divorced in 1945 but by many accounts remained good friends. Keen to get back into the movie business, Broccoli called in a favour with his cousin and got a position as the production manager on the 1946 Irving Allen picture "Avalanche". The film received a mediocre reception from critics and cinema goers but it got Broccoli back on the scene after the enforced absence and more importantly, Broccoli was introduced to the Polish producer/director Irving Allen. Cubby would forge a successful working relationship with Allen and with the encouragement of some of his friends of the day, including Charles K Feldman and of course his cousin Pat, Broccoli partnered with Allen to produce pictures. Allan and Broccoli founded a company called Warwick Productions. The company moved to the UK where the government were making it affordable and effective to produce big-budget pictures in the country and signed a deal to have their movies distributed by one of the "little three" Hollywood labelers, Columbia, in the days when it was an independent distributor. There were a number of other financial benefits to bringing their productions to England, but primarily, labour and on-screen talent was less enforced by the UK unions and hence, lower pay-rates. The producing partners worked together first on the 1953 production "The Red Beret" (dubbed "Paratrooper" when sold to the US markets), a war flick for which they hired the up-and-coming director, Terence Young. Young assembled a cast that included Alan Ladd - who signed up to Warwick productions after a series of disagreements with his old studio, Paramount. The picture was met with reasonable financial success scoring $8 million at the box office and only costing the producing partners $700,000 to finance. Albert Broccoli quickly became a budding producer. In 1951 Broccoli met and married his second wife, Nedra Clarke who accompanied him to the UK to shoot his picture. The pair adopted their first son, Tony, and in 1958 Clarke gave birth to Broccoli's second child, his daughter Tina. That same year Nedra fell ill and in the complications passed away. Despite busy and harrowing family events, Broccoli produced sixteen productions between 1953-58, including "Hell Below Zero" (1954), and "The Black Knight" (1954), both of which starred Ladd and later, "Safari" (1956) and "Interpol" (1957). In 1957 Broccoli re-read Ian Fleming's fifth James Bond adventure, "From Russia With Love" and whilst nursing his late wife, considered the possibility of making Bond into an on-screen adventure. Nedra and Cubby returned to the USA for the last few months of her life, and whilst there Broccoli enquired as to the availability of the rights to Bond. He was initially met with disappointment to hear that there was another party interested in the opportunity to put Bond on the big screen and for a while, thought very little of it. In 1959, Broccoli was married to Dana Natol an actress and novelist in her own right. Cubby took Dana's teenage son, Michael Wilson under his roof as his own and together they parented young Barbara Broccoli. As the Broccoli-Allan partnership dwindled and Cubby required a new project and a new production company, the producer met with Wolf Mankowitz - a friend and British playwright. 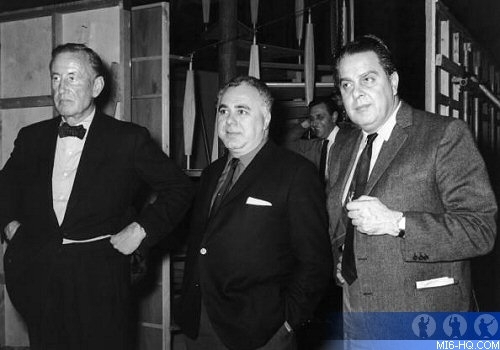 During the meeting Wolf revealed that he knew the other party interested in Bond and it was a Canadian stage producer by the name of Harry Saltzman. Mankowitz teed up a meeting between his two friends and instead of competing for the rights to the suave secret agent, formed a new production company. Danjaq (a compound of Dana and Jacqueline, wives of Broccoli and Saltzman) would be the holding company that would own all the legal rights to 007 and his adventures whilst EON Productions would be headed up by Broccoli and Saltzman and actively producing James Bond movies. To produce their first Bond picture, Cubby and Harry needed some very serious financial backing. The pair shopped around the studios and distributors that might seem prepared to put their name to a 007 adventure. The books in themselves were successful in their own right but it took immense insight to conceive of the success of the Bond films. United Artists, a division of MGM, agreed to back the production budget of $1 million provided their first picture was "Dr. No". Bond went into production in 1961 and hit the screen a year later with "Dr. No" under the reliable guidance of Broccoli's old colleague, Terence Young and a young Scots actor portraying Bond: Sean Connery. The picture proved to be an impressive success and cemented a nine-film partnership between Broccoli and Saltzman. Broccoli and Saltzman must have been both lucky and skilled to attract talent and experience that came with the likes of Terence Young, Bob Simmons and Ken Adam to the Bond films and all the whilse knowing exactly what to serve the audience, time and time again. The following year, Broccoli and Saltzman would produce their one non-Bond production under the banner of EON Productions. Originally the deal with UA called for one Bond film and one non-Bond film to be produced per year. 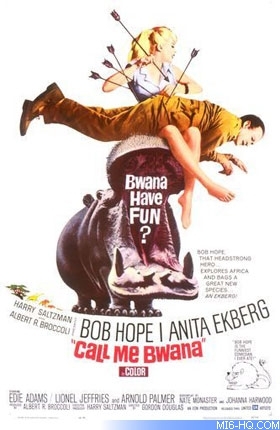 Tthis would quickly fall by the wayside, however, the film that did make it to the screen was "Call Me Bwana". Set largely in Africa and headlined by Bob Hope, whom Broccoli had met almost 20 years ago as a junior, "Bwana" was a one-of-a-kind for EON. Over the first nine Bond films, the Bond team made immensely successful films and Broccoli and Saltzman saw the transition from Connery, to Lazenby, back to Connery, before Roger Moore took up the mantle of Bond. During the production of "Live And Let Die" and "The Man With The Golden Gun", Saltzman began to be pre-occupied with his falling shares and investments and eventually got to the point where he could no longer have a share in EON Productions. By the time Roger Moore's second 007 outing hit the screen Saltzman was all but bankrupt. Broccoli brought Saltzman's shares from his producing partner and gained 100% control of EON Productions. He set about his first solo Bond picture in very grand style. 1977's "The Spy Who Loved Me" proved Broccoli as a more than capable producer, an expert leader and a loveable and amicable boss for all concerned. One of Broccoli's biggest challenges came about on this production - his need for a fantastic finale and somewhere to stage it. 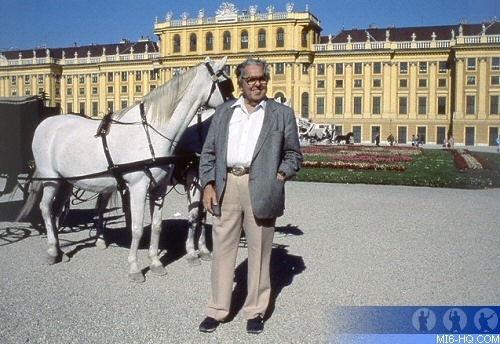 Above: Broccoli on location with "The Living Daylights" (1987) in Vienna, Austria. The picture called for a space that could fit three life-sized nuclear submarine mockups and Bond and the baddies could do battle in and around the gigantic bowls of a super-tanker. 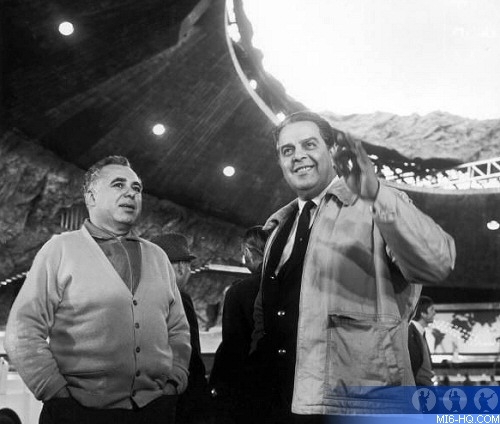 There was not a stage in Europe that would house the set dreamed up by Ken Adam and his team. Instead of rejecting the plan altogether, Cubby dedicated time and energy to the search and when there was clearly no place hospitable, sought permission to construct a soundstage at Pinewood Studios. Dubbed the 007 Stage (and later the Albert R. Broccoli stage in his memory), the gigantic studio space in Buckinghamshire, UK is another of Cubby's outstanding contributions to cinema. In 1982 Broccoli's achievement in cinema making was recognised by the Academy when he was awarded the Irving G. Thalberg Award - a prestigious award for producers who contribute a consistently high quality of motion picture. Not only Cubby, but also some other fantastic and noteworthy producers have been presented with this award, including Alfred Hitchcock and Walt Disney. In 1990 Broccoli stood down from his regular post as executive producer on the Bond films, having completed the lukewarm "Licence To Kill". Although now a classic loved by fans, Broccoli's 16th Bond picture failed to perform up to the usual high-standard for 007 at the box-office. Despite this minor setback, the legacy of the Bond pictures had been surely guided by Cubby's brilliant leadership for more than 28 years. 1995's long-delayed "GoldenEye" saw Michael G. Wilson and Barbara Broccoli take up the mantle of co-producers - the first co-producers the Bond films had seen since 1976. Cubby could not completely let go, and rightly so, overseeing the production of "GoldenEye" as an un-credited consulting producer. Later in life, Cubby discovered another passion - racehorses - the game that had got him to Hollywood in the 1940s. Broccoli owned a horsed named Brocco, which won the Breader's Cup in 1993. 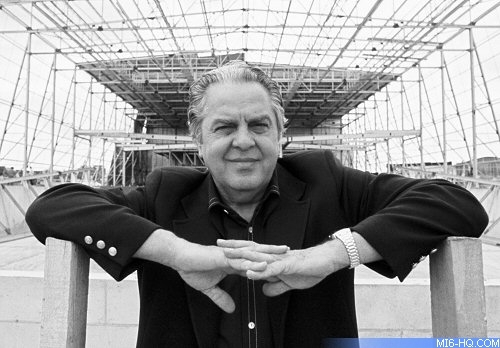 Albert R. "Cubby" Broccoli passed away in his home in Beverly Hills, USA in June, 1995, aged 85. The long-time producer suffered a heart failure. He was given a Roman Catholic burial and a ceremony attended by Desmond Llewelyn and Timothy Dalton to name just a slim selection of his giant Bond family. 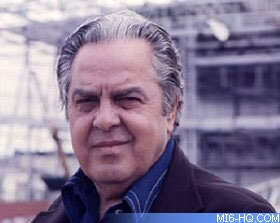 The 1997 production"Tomorrow Never Dies" is dedicated in loving memory to Cubby Broccoli.